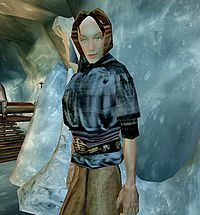 Kolfinna's Dwelling is a small cave dwelling along the western bank of the Iggnir River, northeast of Fort Frostmoth. 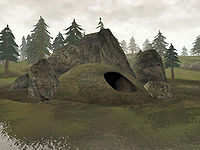 Located straight east from Raven Rock, it is the home of Kolfinna. She wants retribution for the death of her husband. There is little of interest in the cave. Gustav's Chest holds the reward for Kolfinna's quest and three barrels contain 250 iron arrows each. Five coins and some eating utensils make up the rest of the treasure. Kolfinna is the only inhabitant. A Wife's Retribution: Help extract wergild for a grieving widow. This page was last modified on 18 May 2013, at 19:26.